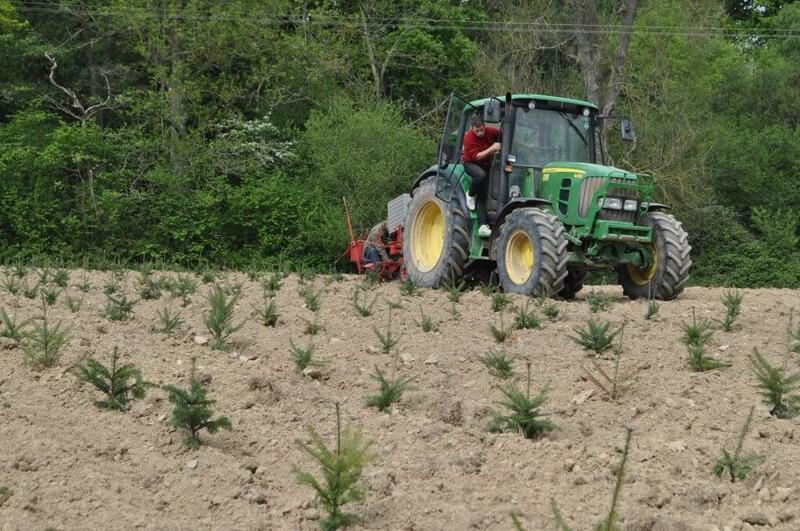 The business of growing Christmas trees is a long game requiring planning far in advance and year-round work. The arrival of Spring in Sussex means planting time for the team at Send Me a Christmas Tree. We’ll receive lorry-loads of tiny saplings at the farm, grown from seeds originally sourced from ancient Georgian forests (that’s Georgia in eastern Europe, not the US state). At the time of writing, we’re planting around 20,000 of these saplings each year on our two Sussex plantations. A three man team (this year consisting of Farmer Tom, Phil and Brandon) will spend weeks inching over freshly-harrowed fields. The tractor needs to be driven at under 5mph, and in a nice straight line to keep the rows consistent. The other two members of the team will sit atop a specially-designed planting machine mounted to the back of the tractor, and drop each sapling in by hand at fixed intervals. Take a look at the video to see the team in action. Phil deep in concentration, trying to keep those lines straight. Lovely bushy tree – very impressed – thank you very much!